What a sweet picture of you all! I know your home is warm and fun to visit for those grandchildren. You have shared so many cute things today. Congratulations on winning Mary's giveaway! I love your pumpkin floral arrangement. So easy and so pretty! Thank you for sharing with us and coming to tea. Have a wonderful week, Kitty. Well you made some folks very happy! I love your cupcakes! What a wonderful win, and it was a hit with the whole family! I think your pumpkin bouquet is outstanding! Gorgeous! Thanks so much for linking to Tuesday Cuppa Tea! Hi Kitty, congrats on the win from the giveaway. I love the pretty pumpkin floral arrangement you made. What a clever idea. The cupcake are so cute. How fun to be teaching the grandkids to bake! Have a wonderful week and have a Happy Halloween! That flower arrangement is beautiful! The picture with your grandkids is cute too. I bet they have a great time baking with you. Kitty, you were the perfect one to win Mary's gift. I know your grands had loads of fun at this cooking camp. Cooking Camp is such a fun idea! Your tea time is adorable inside or out. I had to bring my witches tea inside too, but that is little price to pay for al the wonderful rain we received in recent days. Yippee! Beautiful flower arrangement as well as tasty goodies. Mary has shared some great ideas. If only I'd get busy in the kitchen! What great fun they had and so many precious memories. I thank they loved it and your table is darling. The flowers look so cute in the arrangement. Yummy stuff! The first thing I thought when I saw your giveaway win was that it would make a great project for you and your grandchildren! What fun! And I love the picture of you all. Your grandchildren are blessed to have you! A beautiful picture to remember always! I think the giveaway was meant for you, with all the baking you do! Love the idea with the pumpkin! Wishing blessings to you! Your grandchildren must have loved all those fun & yummy treats! Beautiful photo! Congrats on your win & I do love your pumpkin & flowers centerpiece! this post ALMOST makes me wish I had kids........ALMOST!!! Adorable and congrats on your win!! Hi Kitty, What fun and what a wonderful gift you received in the giveaway. Such a special seasonal idea. Love all these goodies and those cupcakes are adorable along with the gorgeous floral arrangement you designed. The best part is the fun you had with your grands and all they learned in the process. What a gorgeous family you are and this is the best photo. Just look at those smiling faces. You are the best grandmother and the kiddos are so blessed to have you in their life! But I know you are saying, you are the blessed one! and you are my sweet friend. Congratulations on winning Mary's fun giveaway, Kitty! 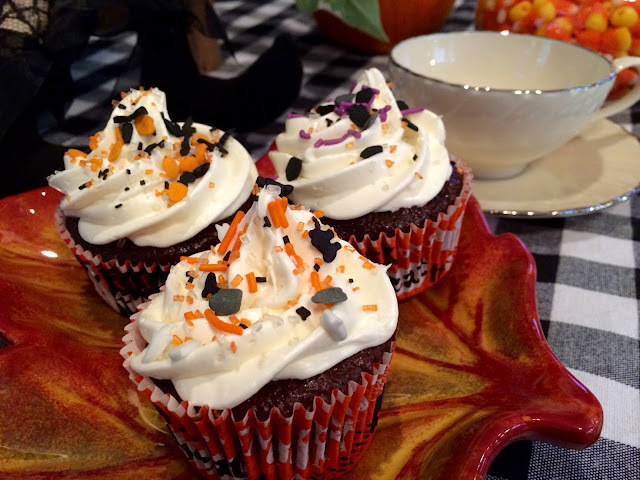 Your super cute post is sweeter than any Halloween candy! Love the friendly witch, the blooming pumpkin and the happy grandkids. Good thing that the ax-wielding, hockey mask-wearing Jason didn't show up at Nana's Cooking Camp! Sweet treats for your sweet grandchildren. Congrats on winning the giveaway, Kitty! Looks like you are putting everything to good use. Love the pumpkin floral arrangement. Dear Kitty- oh there cannot even BE a more perfect recipient of Mary's baking prizes! You made the most delightful post from your wins, and it is just too perfect at Baking Camp with your grands. You are the best g'ma ever. Congrats on your wonderful win. 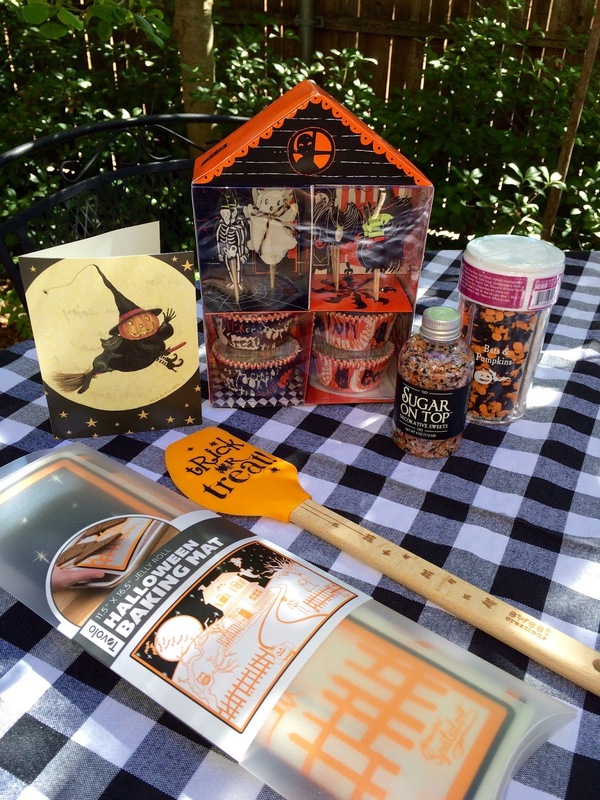 Your Halloween tea scape is awesome! What great fun your precious family had baking. What a beautiful giveaway to win!! I see you made good use of it right away with the grands. :) They are so cute and the photo is priceless! All of you are blessed to have each other. The flower arrangement is gorgeous! You have so many talents. You should see me trying to arrange flowers ~ really a joke. Looks like I bought all the flowers and then just stuck them in a container! This is such a fun post! How neat! What fun Halloween goodies you received in the giveaway! I really like your pumpkin floral piece. Glad Nana's Cooking Camp is still going on past summer. 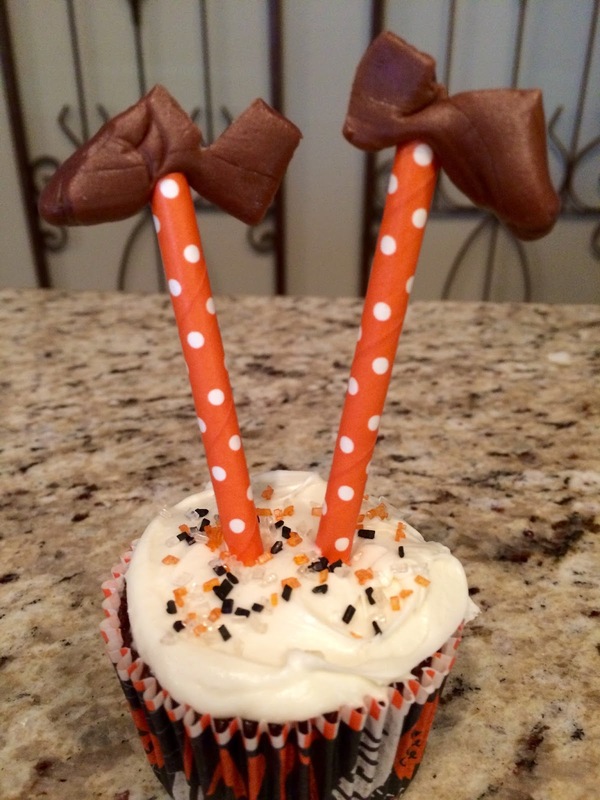 Those cupcakes are so festive and the witch's shoes are so clever. Looking forward to visiting Mary's blog. What a lovely thing to have happen. How nice to share with the grands. Happy Tea Day Kitty! I'm off to visit Mary. Angels to you! ❤️❤️❤️❤️❤️❤️❤️❤️ Everything looks so beautiful. Great idea for the floral arrangement, too. 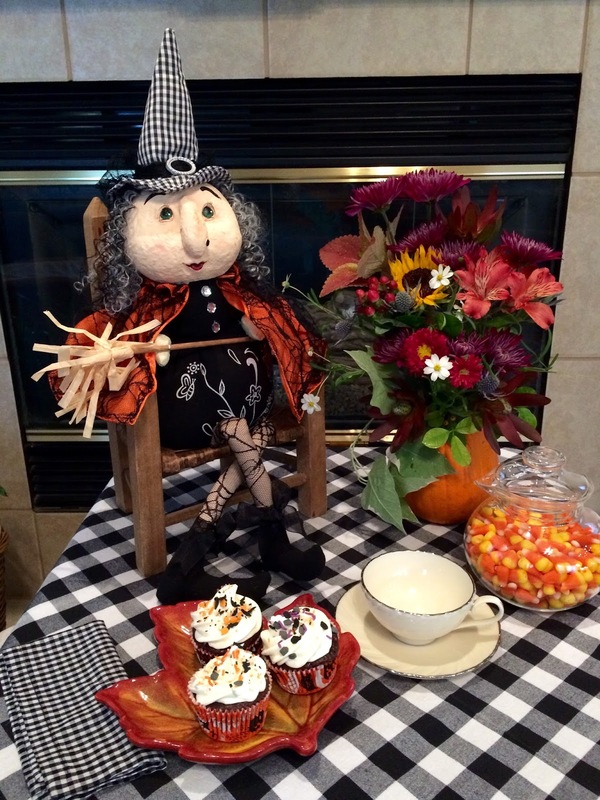 Love the witch cupcakes, grands are getting so big. Congrats on the win, you are the perfect recipient. Such a lovely package to win and happy smiling faces showing off their efforts using the goodies. Great idea for adding flowers to the top of a pumpkin and it looks festive. What a fun gift from a wonderfully talented lady! I love her easy peasy cupcakes with the witch shoes. Your floral is SPECTACULAR!! Wow, you guys sure had fun. Congrats on being the lucky winner! Kitty, what a sweet giveaway! Congratulations! Holiday baking is so much fun. Those witch legs/shoes are just too much! Thank you for sharing! We're you thrilled to win Mary's happy Halloween giveaway Kitty! Your grands look pretty happy too! Love your witch having tea with you! Your pumpkin, wow!! I loved that tutorial, and can't wait to try that! 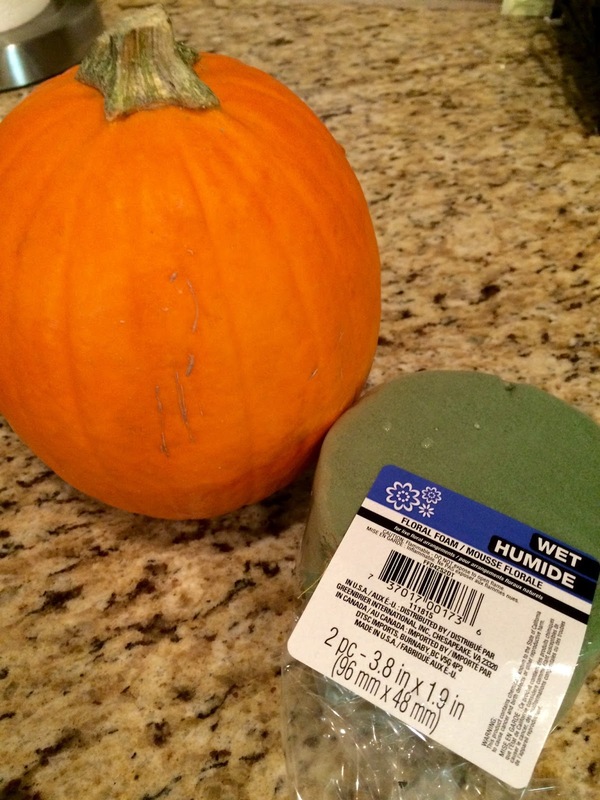 Maybe I'll use my crabby pumpkin! Kitty, what a fun package to receive! 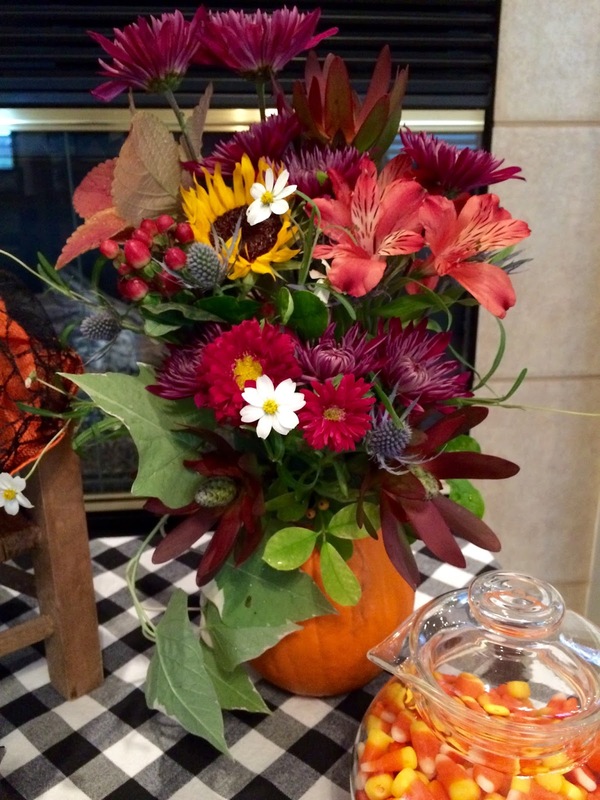 Clever way to do a floral arrangement with a pumpkin. I've always hollowed them out. Love the witch legs! Thanks for sharing with SYC. Congratulations on the win! Looks like you put it all to good use already. 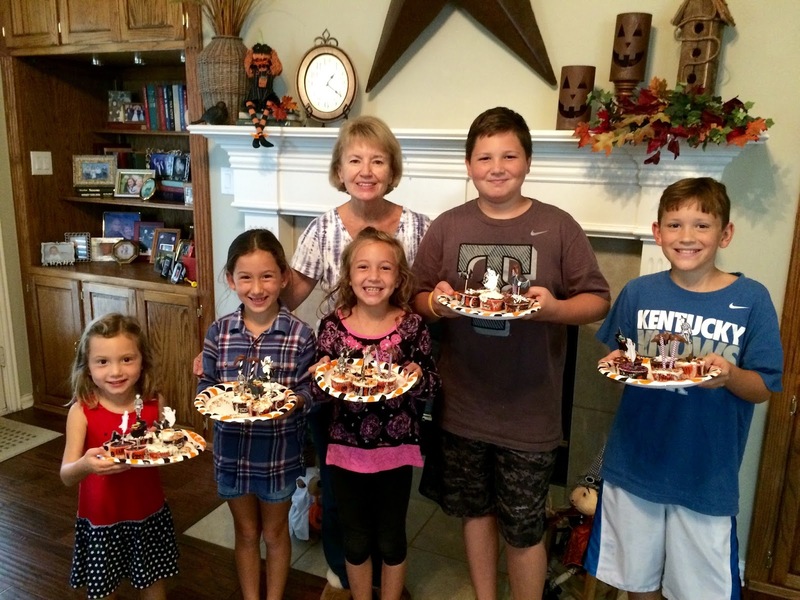 The grandkids look so proud of all their baking goods! I need to remember that trick for making a floral arrangement with a pumpkin. Yours turned out beautiful! There's talk of a Trader Joe's and Whole Foods making their way to our area. Can't wait! What a darling group of goodies! You are a very special winner and I am happy for you. Everything is so perfect for you. Love the pumpkin/flower idea. Kitty, you and your grandchildren are beautiful. I love the treats you made, and your pumpkin is the prettiest ever. Happy November! (Can you believe it's already here?) Have a wonderful week, my friend. Hi Kitty, what a fun project to share with your Grands, looks like you'al had a great time. The cupcakes are adorable and delicious. Thanks so much for sharing with Full Plate Thursday and hope you have a great week.